Many of the finest paintings by masters of narrative painting are notoriously difficult to read, and remain controversial centuries after they were created. This article looks at one of the most beautiful of these, Nicolas Poussin’s (1594–1665) The Empire of Flora (also known as The Realm of Flora) (1631). 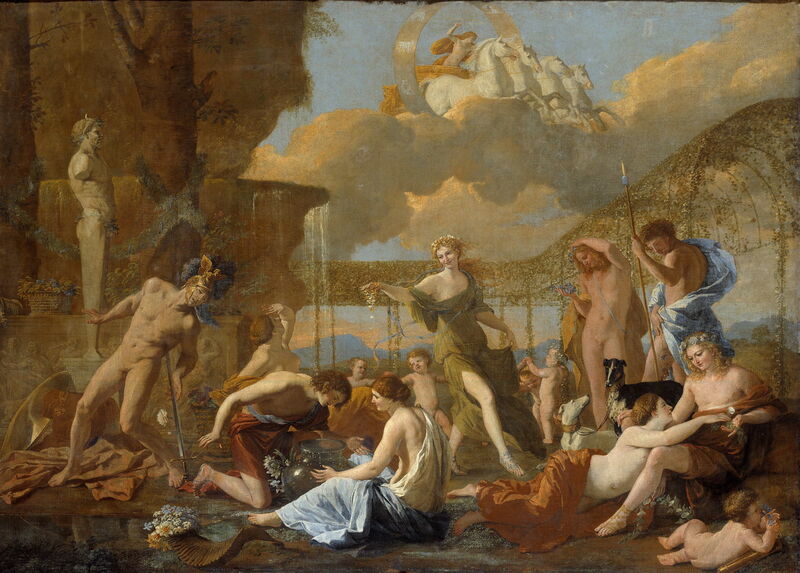 Poussin also painted The Triumph of Flora, a larger work with more figures and a very different scene, dated to c 1627, and now in Musée du Louvre. To keep this article as simple as possible, I will try not to stray too far beyond the one painting. 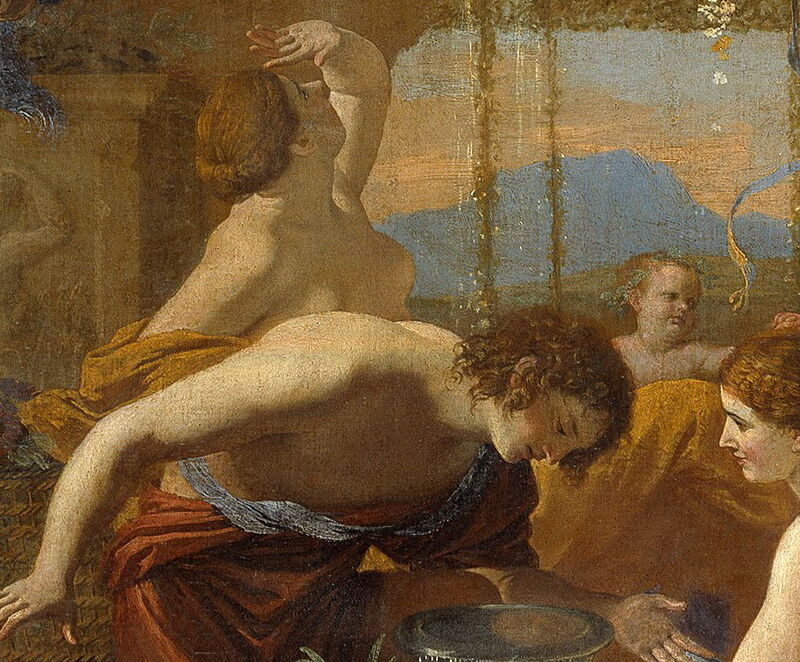 Unusually for Poussin, this painting can be dated quite precisely, as it was documented in the course of a celebrated trial in 1631, to which Poussin gave evidence of having sold the accused this painting. It is thus known to have been painted for Valguarnera, a thief of uncut diamonds, in early 1631. At that time it was also known as Spring, although over the years it has been given several different titles, according to changing interpretations of its subject and meaning. 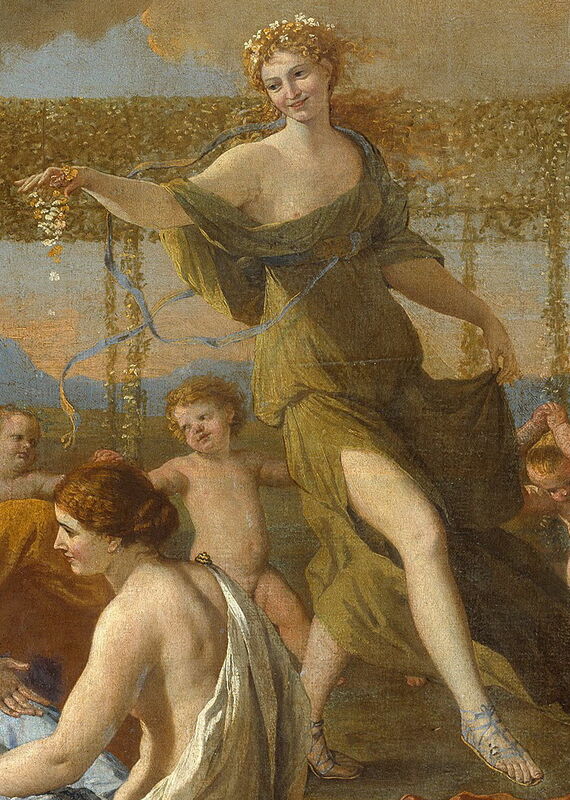 The whole painting is set in a garden, with trees in the left background, a flower-laden system of pergolas, a large water feature, and dancing putti. In this are a series of well-known characters, which I will step through starting from the left. 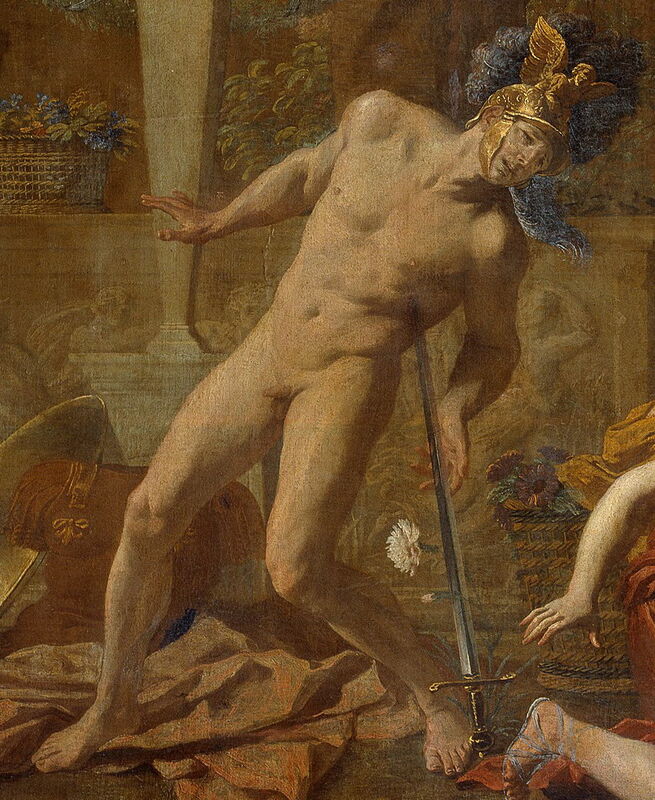 More usually seen with an oversized and erect phallus, and abundant in Roman towns, Poussin has opted for a touch of decorum in depicting the god of gardens and fertility, who was an inevitable associate of spring and its flowers. His phallus is wreathed in greenery too. After he lost a contest with Ulysses/Odysseus over the arms of Achilles, Ajax fell on his sword deliberately, a phrase which has entered the English language to mean self-effacing capitulation. In Ovid’s account in his Metamorphoses, when Ajax died he metamorphosed into the purple hyacinth flower. However, Poussin places a white carnation under him, which will be coloured by his spilled blood, as the hyacinth is accounted for elsewhere. 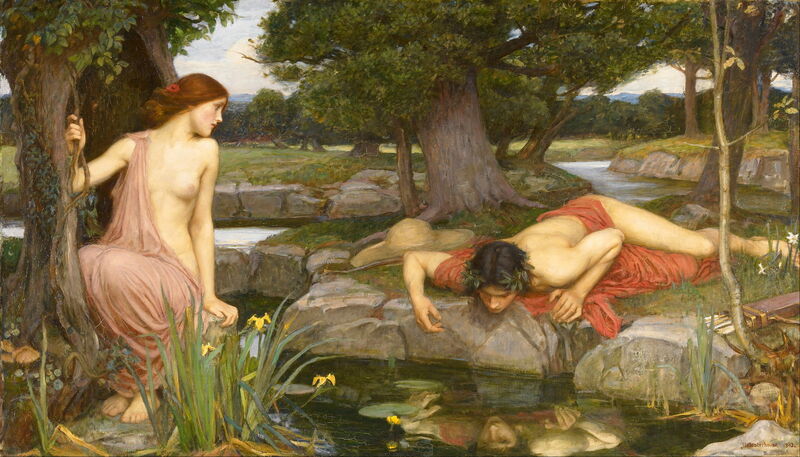 Narcissus is shown at the left, enraptured with his own reflection in the water, while Echo gazes longingly at him. This classical myth is known from Ovid’s Metamorphoses, Book III, and is the union of two conjoined narratives. 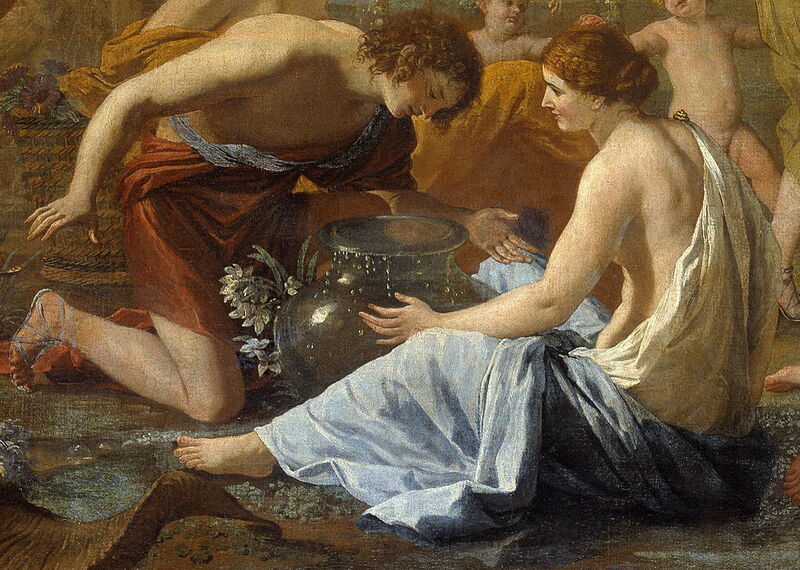 In the second, Narcissus becomes tired of the heat when hunting, pauses by a spring, and drinks from it. While drinking, he falls in love with his own reflection in the water. He wastes away with this self-love, his body being replaced by the narcissus flower, which Poussin shows already growing by his knees. This linked story has remained a popular narrative for paintings, and is well shown in JW Waterhouse’s Echo and Narcissus (1903). She was a mortal who fell in love with Apollo, and because the god would not return her love, she pined away and was metamorphosed into the heliotrope flower (sunflower). She is shown staring longingly at Apollo’s heavenly sun chariot, dressed in the muted yellow of the flower, and behind her is a large basket of heliotrope flowers. 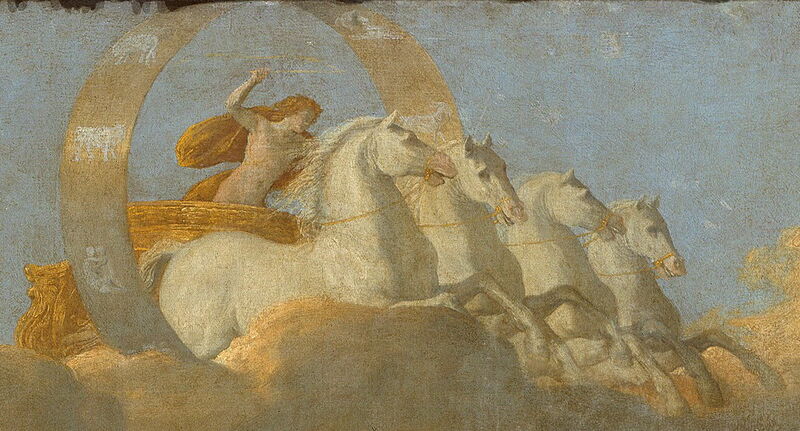 The subject of Clytie’s unrequited love is shown driving the chariot of the sun across the sky, with a band containing the signs of the zodiac. This is very similar to Poussin’s depiction in his slightly later A Dance to the Music of Time (c 1634-6). Although Flora is referred to in several sources, the most complete account of her origin is given not in Ovid’s Metamorphoses, but in lines 194 to 220 of Book 5 of his Fasti, covering the day of 3 May. Fasti is a calendar of feasts and gods, detailed in Latin verse. 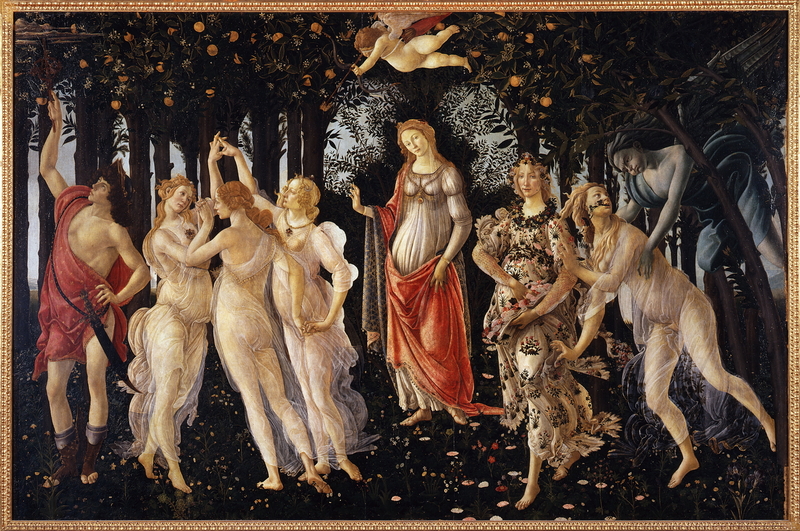 These explain how Zephyrus, the god of the west wind, raped and then made a bride of the nymph Chloris, who then metamorphosed into Flora, shown most elaborately in Botticelli’s masterpiece Primavera (Spring) (c 1482). The mortal Hyacinthus also fell in love with Apollo, who returned his love. But Zephyrus, god of the west wind, was jealous; when Apollo was throwing a discus with Hyacinthus, Zephyrus brought the wind round so that the discus struck Hyacinthus in the head and killed him. He was then metamorphosed into the hyacinth flower, a bunch of which he holds in his right hand (shown here rather than for Ajax). 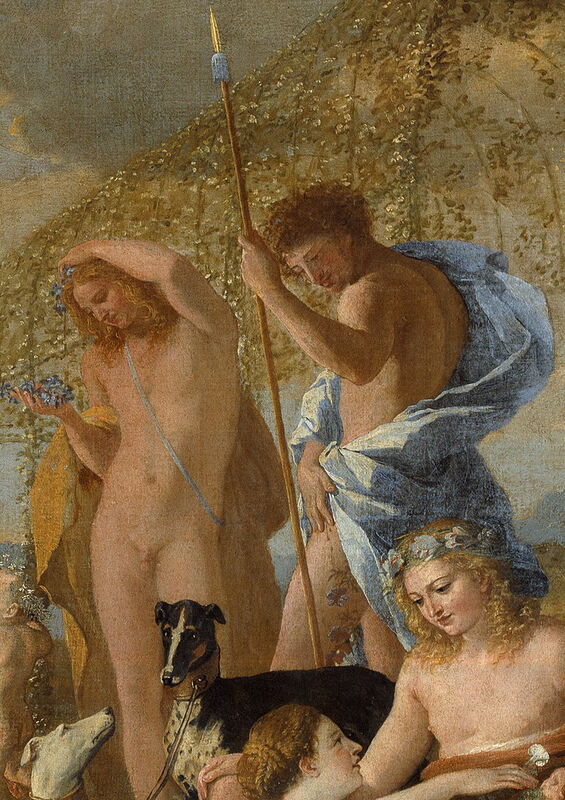 To the right is Adonis, accompanied by two hunting dogs. He was loved by Venus, but was wounded in the thigh by a wild boar that he was hunting, and died. Venus was heartbroken, and metamorphosed his blood into the anemone flower. Shown holding his hunting spear in his left hand, his right hand is spread over the wound inflicted by the boar, from where a string of anemone flowers springs. Smilax sprawls from the left onto the thigh of his love Crocus, seated at the right. Both were punished for their unfulfilled passion for one another, and metamorphosed into flowers – the saffron in Crocus’s left hand, and the rough bindweed (a flowering vine, Smilax aspera) by the left foot of Crocus. 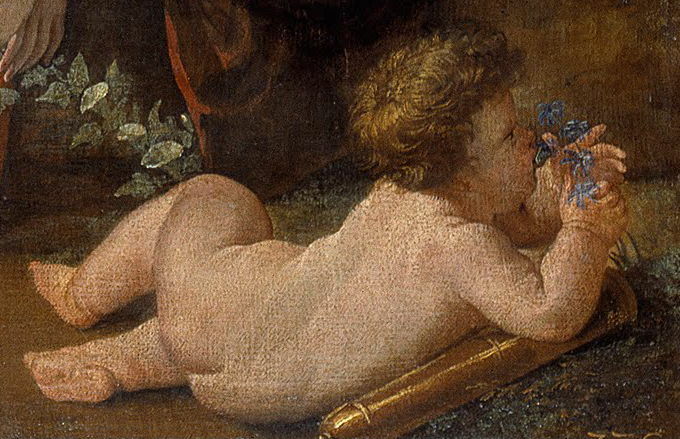 The putto at the bottom right of the painting is resting on a quiver, indicating that he is no mere generic putto, but probably Cupid himself. There are many different accounts of how this unique collection of mythical narratives should be brought together and interpreted. Most obvious are three themes, of the season of spring, flowers and gardens, and metamorphoses. To date, all efforts to produce a coherent narrative of narratives have failed in one way or another. Although many of the individual stories are drawn from Ovid’s Metamorphoses, not all are. Although many involve death and metamorphosis into flowers, not all do. The stories do not chain together in any way, nor do they have any common more contemporary link with literature re-telling those stories. If we cannot bind the stories together into a coherent whole, then we must accept that, like many of Poussin’s favourite books such as Tasso’s Jerusalem Delivered, we are looking at an epic compilation of stories with the common themes of death, and re-birth through metamorphosis. These could remain in their classical Roman and Greek mythical setting, or perhaps themselves metamorphosed into the death and resurrection of Christ. Article on this blog about Botticelli’s Primavera (Spring) (c 1482). Posted in General, Painting and tagged allegory, Botticelli, Metamorphoses, metamorphosis, narrative, Ovid, painting, Poussin. Bookmark the permalink.